When looking out the window of a moving car or when walking down a busy street, what do you typically see? Generally you'll see homes, businesses or other similar buildings. But how do you know what they are? 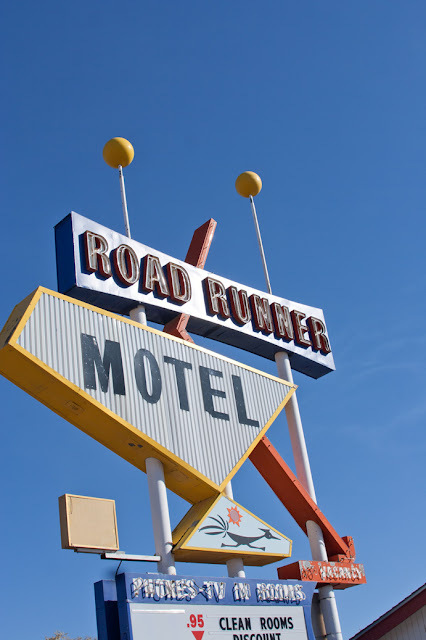 It's because of the sign letters that you may be able to see on the outside or above on a billboard. I'm sure you're saying, "no, my home doesn't have any signs on it". But what about your address? The numbers on the outside of your house that make it stand out from all the other houses. There are other signs to show you the time or even the weather forecast. The other types of signs you see could be huge advertisements. These can be large over the top computerized signs, or even just handmade paper displays advertising a yard sale. Is the world becoming so over advertized that when you can look up in the sky and see not a bird, but a plane trailing an advertising banner, a blimp with printed advertising, or even skywriting? Is this the only way we know how to express ourselves and how to get our point across? We also need sign letters. when we are traveling. How do you know which road to take if you don't know which road you are on, which exit is the nearest rest room, or a road leading to your destination? These are very important things, especially when traveling long distances. Besides directing traffic on the outside of buildings, signs can also do the same on the inside of buildings. If you're in a hospital or airport, you can almost always look up and see a sign pointing you in a direction with a little map of where else you can go from there. Sign letters can be very helpful even to those who can not see. That may not make any sense, but the use of Braille as signage is extremely important to people in this day and age. On that note, if you're watching a T.V. show and see the words being written out at the bottom of the screen that some of us take for granted. 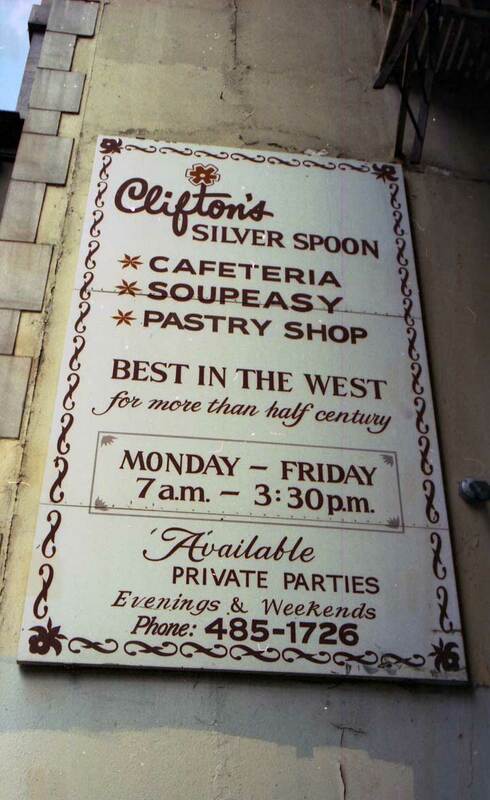 Other ways that we use signage: a restaurant can display the dish of the day with changeable letter signs, or even with a computerized digital version. Those are becoming increasingly popular with many businesses. What other display do you need to make a choice for your meal before you even enter the restaurant? Without a scoreboard at sporting events you may have a hard time keeping track of the score. In those sorts of stadiums you also have arrows, like in an airport, that will direct you to your correct departure gate. Traffic control signs can also help to block off traffic from an accident and save others from suffering the same fate. Without signage or display sign letters, it could become increasingly difficult to get through certain aspects of the day as you travel around. The days of the hometown cafeteria are over, I mean...well...with the exception of Hometown Buffet, which is nothing like the old-style privately owned cafeterias of yesteryear. Nice clean rooms. Best rates in town. 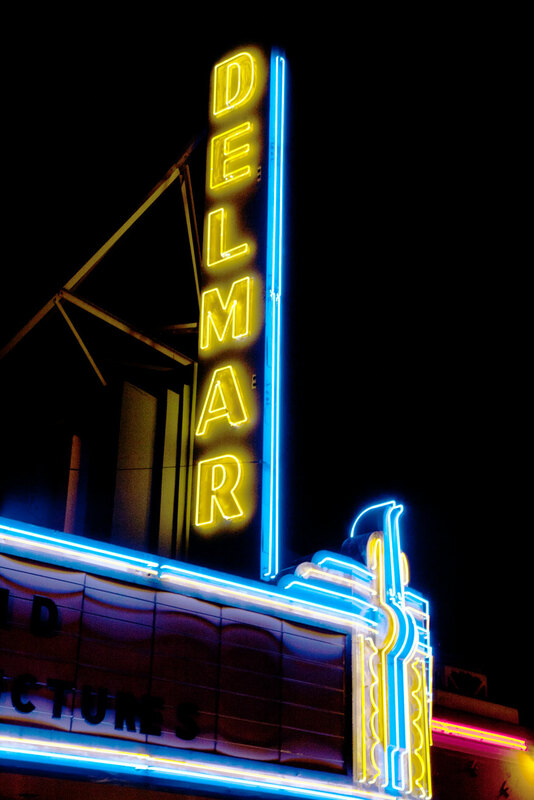 What makes one neon sign immune to the wrecking ball and another one still left standing is a matter of fate and luck. 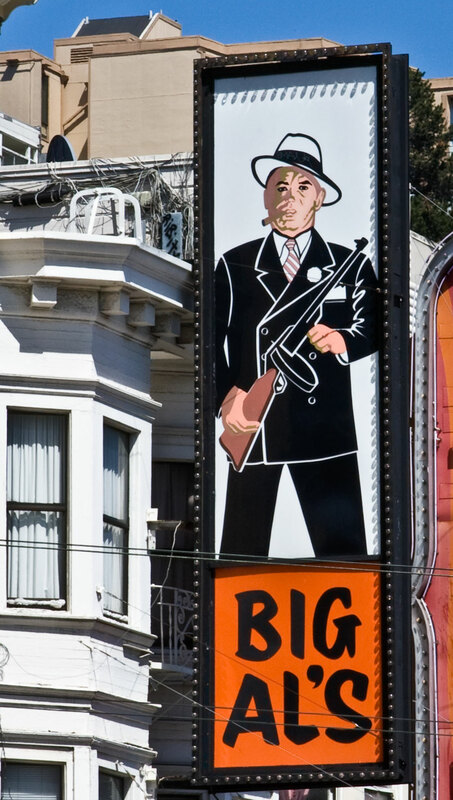 Suburban areas that are quickly gentrified are the first to see the signs go. 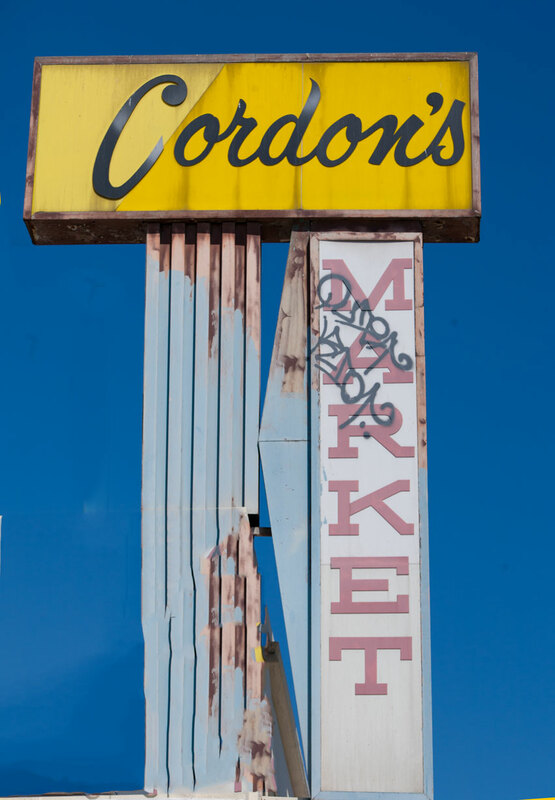 In Miami, for example, a few lucky areas have been preserved as districts where both the architecture and signage has been preserved. But outside these areas major rebuilding has taken place without regard to preservation. The city of Paris saves just about every sign and building ever erected, while the city of London does not. World globalization and corporate control of the land in much of the world is bad news for old neon and politics plays a major role in any preservation program. 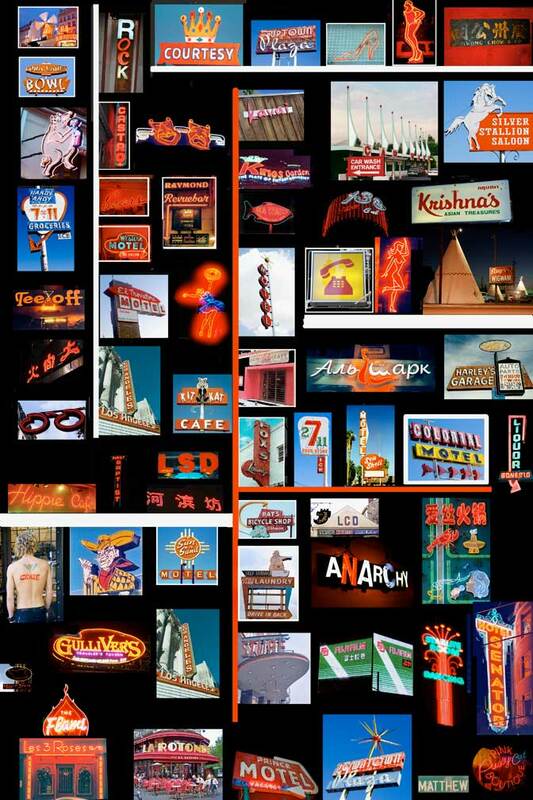 In the city of Los Angeles the Neon Museum (MONA) hosts a program to save and repair the neon so that the signs of yesteryear still glow. Who doesn't love a roadrunner. Throughout the Western United States, the bird is revered for it's sleek body and long tail. Homage to the lovely bird exists in signage in a few spots of the region. 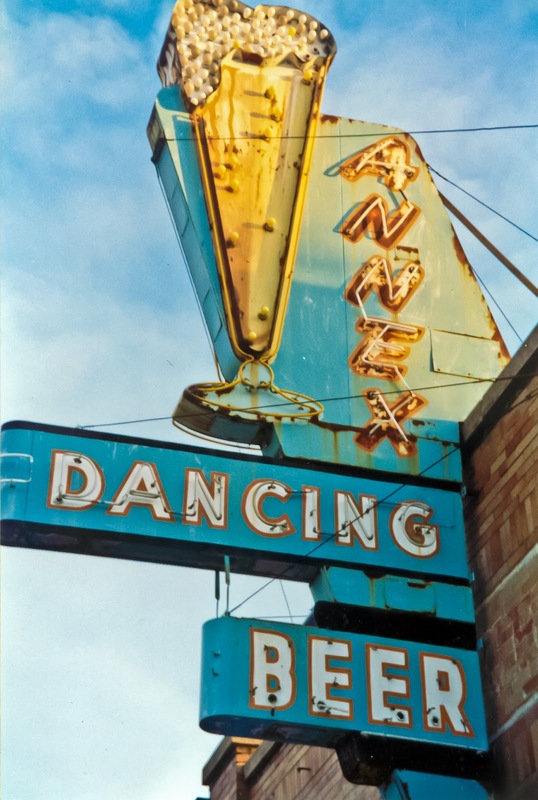 Neon’s kinetic radiance turned the great sign of the mid-century into a symbol of American optimism that spread throughout the world. The reddish orange glow in the word Hill Top above was achieved in a vacuum discharge tube. The makings of a sign begin with displacing air in tubes with neon. First, the sign maker bends the tubes, a tricky, yet artistic task as each letter must conform to the other and like letters must be bent in exactly the same shape. 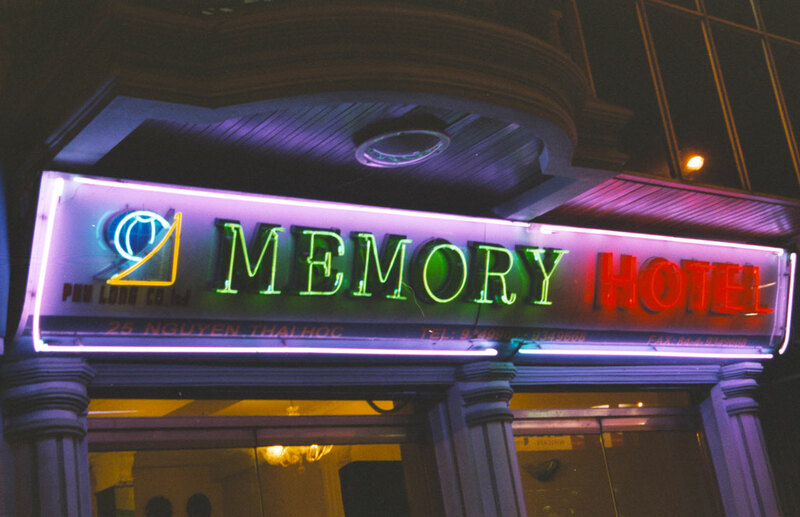 To make the neon glow, an electric current must flow thorough the tube. The colors depend on the mixture of gasses inside the tube, usually neon, argon and mercury. One of the coolest neon signs that remains standing in Southern California. Anybody know the history of this one? Well, then. Here's a pot leaf. Creating and displaying a marijuana neon sign is not illegal in most places. Most of the time it's an irony when you see one because it's usually displayed in places where pot isn't sold (hemp-made items are a possibility)--like head shops that sell the paraphernalia, but not the weed. 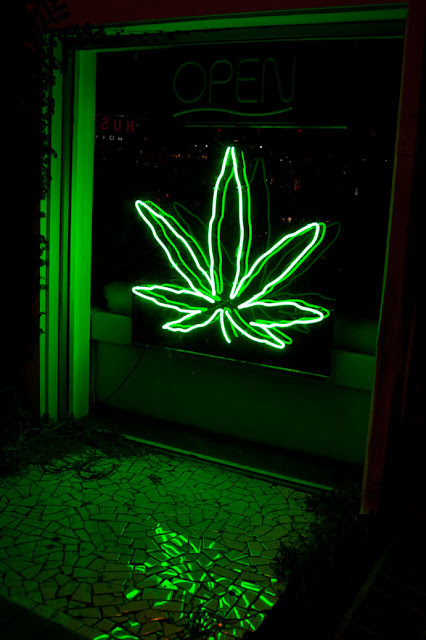 In my town the marijuana dispensaries wouldn't dare display something like this outside their business (I live in Palm Springs, CA) because it would attract too much attention. The only evidence of there being a business that deals in medical marijuana is a storefront with nothing on it or some innocuous sign with the word "organic" written on it. Since I don't live in Colorado or Washington state, I have no idea about what's happening the marijuana signage. Since it's legal there, perhaps pot shops don't have to be shy about saying what they are. In some places in California (like the Coachella Valley where Palm Springs is located) there are far too many people who would object to these signs for them to be put up in front of pot shops. But that still doesn't mean that they're not used in other types of shops. They're also popular in stores that sell clothes that's made of hemp. Guess I have to take a trip to Boulder, Colorado to see what's happening with signage advertising marijuana. The Story of RCA's Nipper--"The Master's Voice"
A character molded in plastic, neon and steel in roadside signage play an important role of attracting the passersby, who can be lured inside by a figure outside. One of the best examples of the characters coming alive lies with RCA Victor's mascot, Nipper. Nipper became associated with the service and products that RCA offered in the early part of the 20th century. No where is the matched or unmatched association between product and business evident than the phonograph-listening dog Nipper of RCA Victor fame, who was created back in 1910 when the company was known as Victor Talking Machine Company. 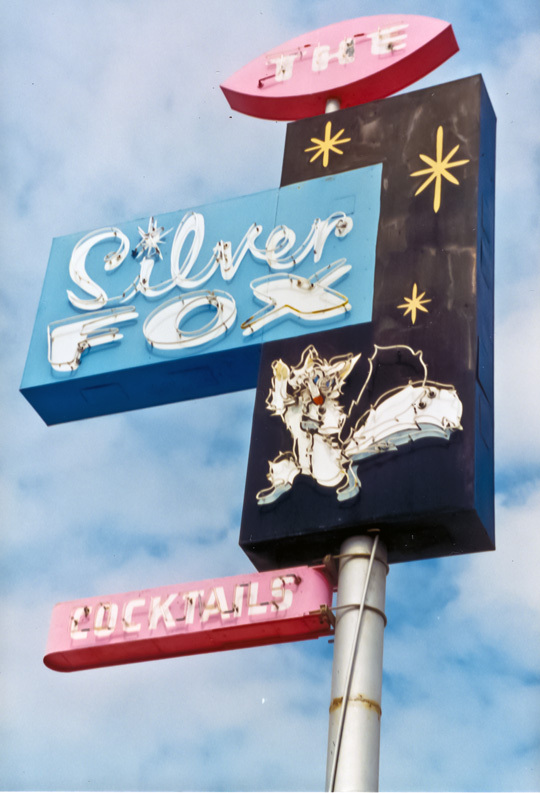 Nipper became the lifelong best friend of the company, so much so that signage that included him in the 1950s the dog sat alone without the phonograph (see RCA image). The dog alone became a lasting symbol of the company. His voice was labeled "The Master's Voice." 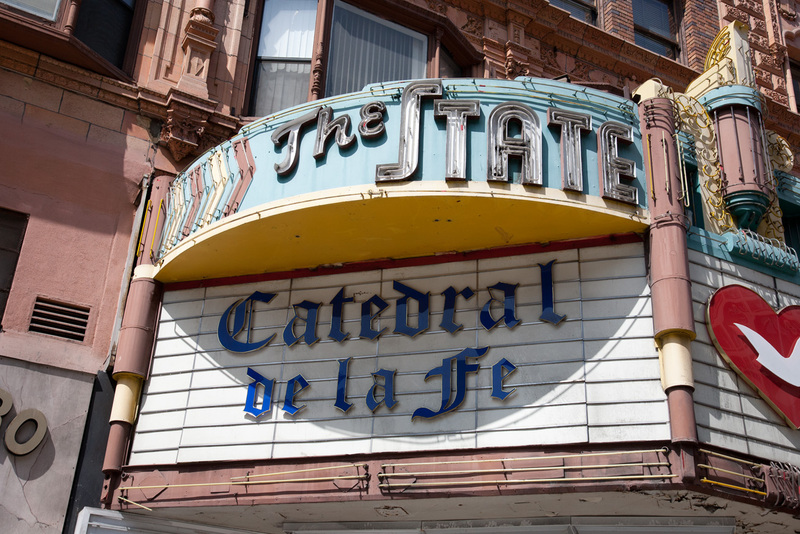 It's amazing how classic Art Deco era movie palaces are places where you can find lots activities, but have nothing to do with the movies. Here at the Catedral de la Fe nightfall turns the 1921 building into a rowdy Pentecostal shindig, bringing this part of downtown LA (Broadway and 7th) to its knees (so to speak). Usually I don't like what they do with these signs from boarding them up to taking them down, but this one is special. I mean how many Art Deco era movie houses are churches, much less churches that have attempted to match their sign with the style of the movie house sign? Wondering down the streets of LA inevitably will lead you to the Mexican neighborhood where Catedral de la Fe is located, which really has no name to refer to the vibrant south-of-the-border culture here, but rather the generic, meaningless label "Historic LA." 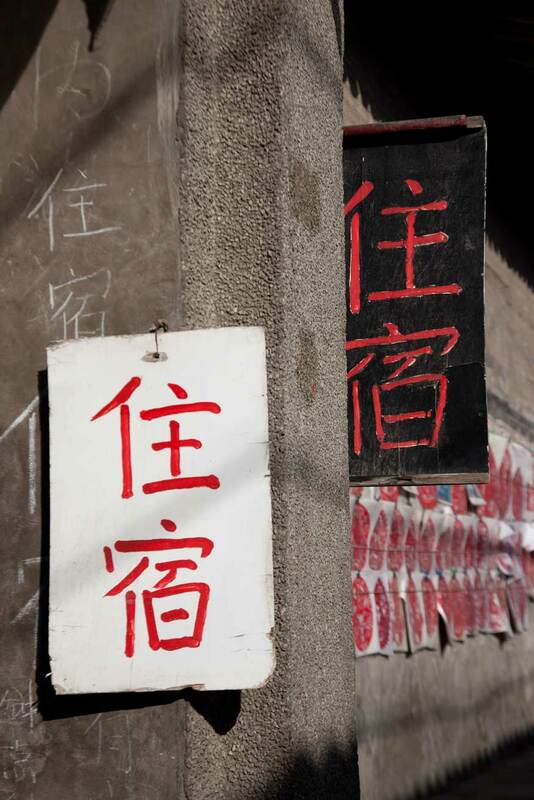 I'm not sure what these say, but they are certainly yin-and-yangish. 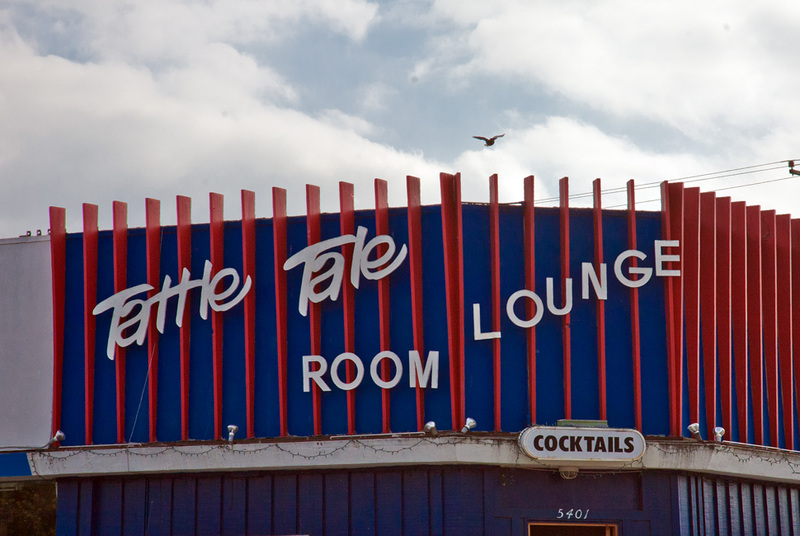 Here's the lovely Tattle Tale Room in Culver City, California, a cocktail and karaoke bar. No retro sign blog would be complete without the announcement of the new television show, Bates Motel. 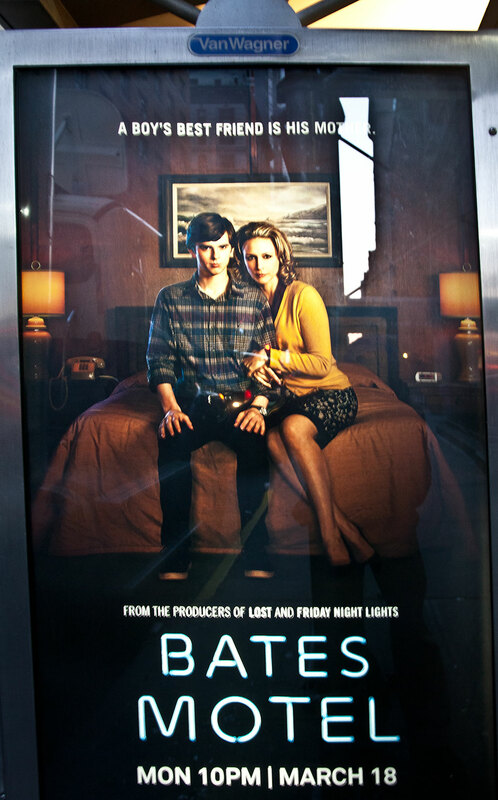 Neon text applied flawlessly upon a black background is the perfect look for the horror genre of the show. Added to that is a mother and son who look as if they are very close--just a little bit too much too close. 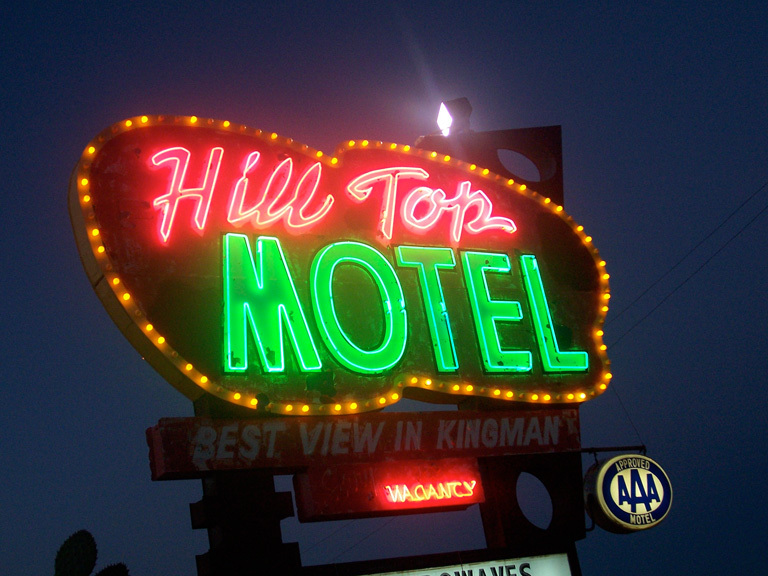 Neon signage has always been the ideal setting for horror flicks. 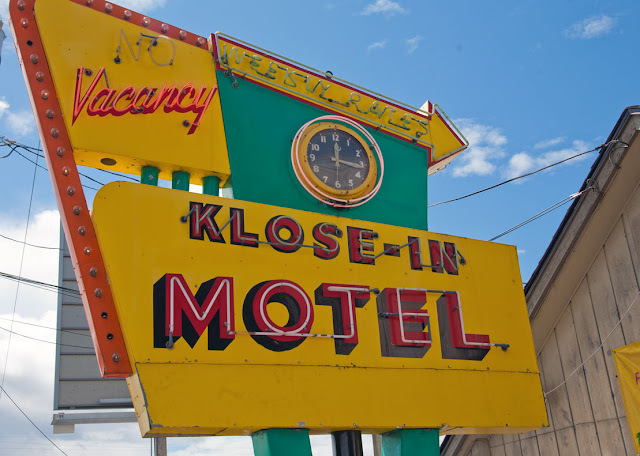 Go ahead, comment on your favorite slasher flick that took place in an old motel. This has always been one of my favorites. 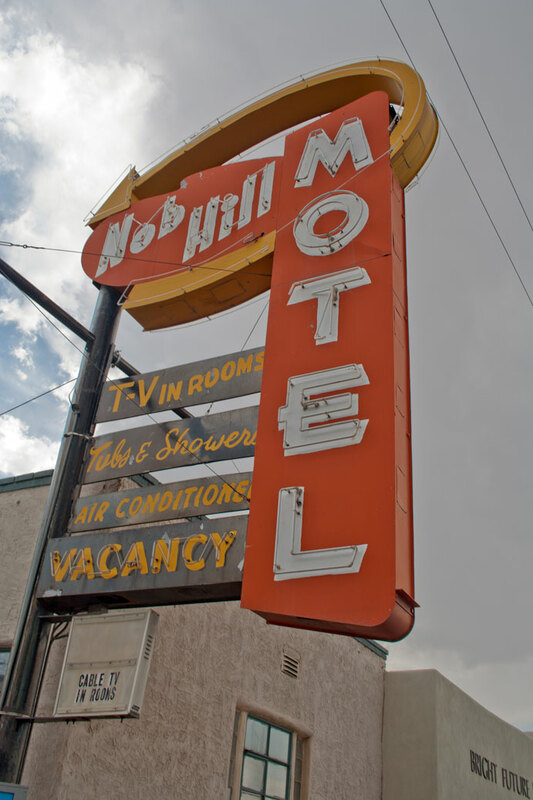 Not a stand-alone sign, but commonly attached to motel signs back in the seventies and eighties. What can I say about this one? There's nothing better than nothing. So minimalist. So blank and empty. To be sure, while that is seemingly the case with this shot, it's filled with interesting elements among all of the "nothing." Consider the bricks on the side of the building, the perspective, the people out front, the building's isolation, color and text on the glass windows. Just gotta love this sign. Take a break from all the confusion at Tahrir, the mess that appears to be putting an awful damper on tourism there. 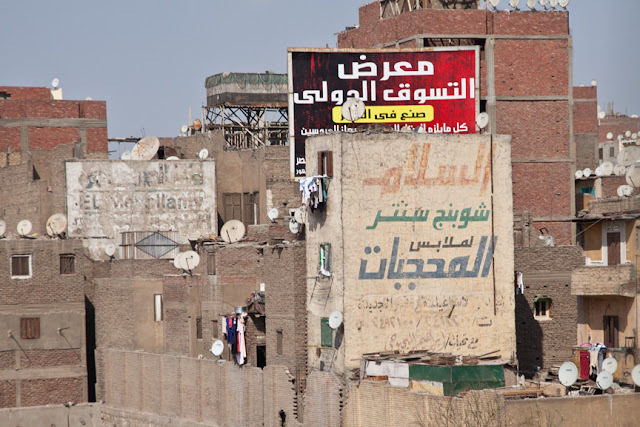 Here's some ghost signs in Arabic, each line of text written in a different color. 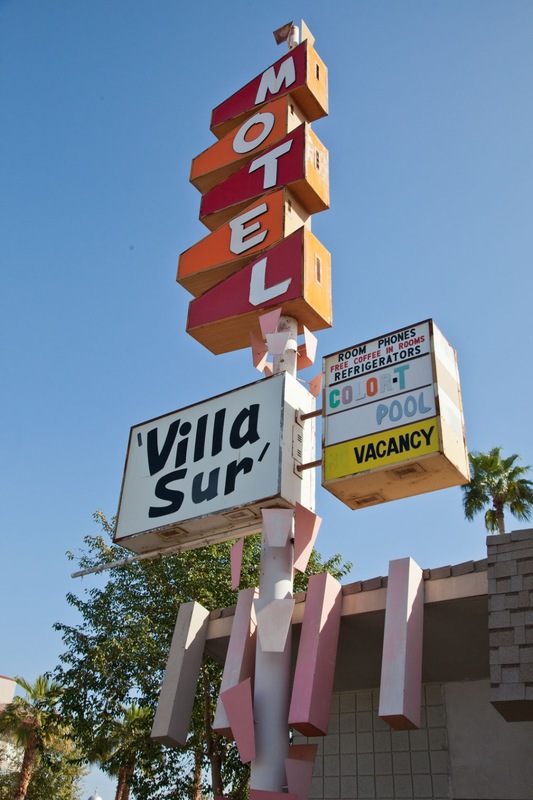 Here's the Villa Sur Motel, a retro motel with lots of pink and red on the US/Mexico border in Calexico. 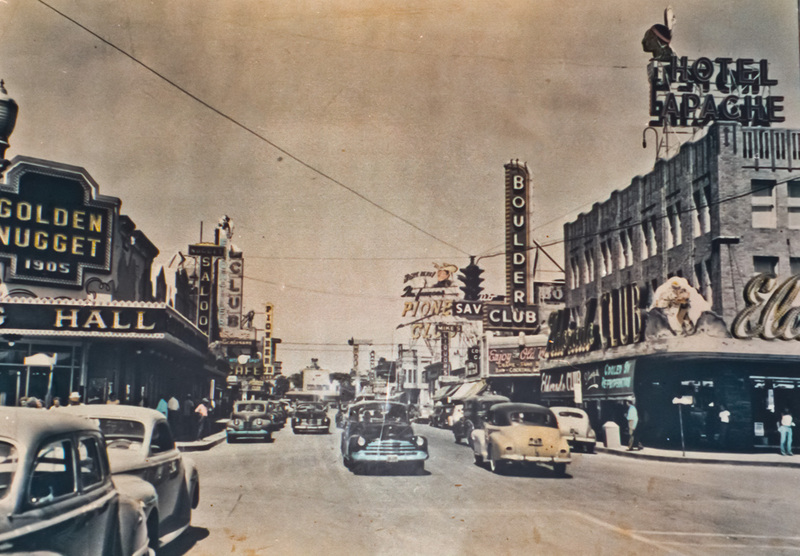 To the south of this small town is Mexicali, a sizable Mexican metropolis about 60 miles east of Tijuana. This is one of the border cities were Americans go to the dentist and doctor because they pay half the price for care. Its population is nearly 700,000. This sign collage was organized in a similar way that a famous artist organized the objects in his paintings (with the dividers). Can you name the artist? This sign collage is perfect for the minimalist wall. Look closely and you'll see that some of the ideas are just a tad bit naughty, but certainly not offensive. Designers didn't follow the rules on this sign. Add the elements of time and...tick, tock...you've got an array of bad design, graffiti and rust on a sign that's falling apart. From the get-go, this sign breaks the graphics Golden Rule of mixing sans serif and serif typefaces, the former with no sticks on the end of the letters and the later with them. This type face is serif. This type face is sans serif. If you have trouble remembering which typeface is which, just be aware that sans means without, so that sans serif means without sticks. If you're not sure where the sticks are read about fonts to get educated about them. A tale of a little boy outsmarting tigers, saving himself and others from certain death became one of serious racial overtones. So the story goes as written at the turn of the century: a little boy goes loses his clothes when tigers antagonize him. In the end, the tigers turn on each other, melting into butter that ends up coating Sambo's pancakes. This is the root of the Sambo's controversy. Earlier in the century the name Sambo had been associated with a controversy surrounding the book, Little Black Sambo (forthcoming image), published in 1899. The boy's overriding characteristic was that he was very dark-skinned, a trait that some took advantage of to label him with stereotypical African demeanor. Sambo morphed into controversy when other publishers took on the new version of the character, publishing books that depicted him derogatorily. The character Sambo, recreated by Sambos began not as the morphed controversy that had been created, but returned as a heroic young boy of East Indian descent. Many refused to see Sambo as he was originally. 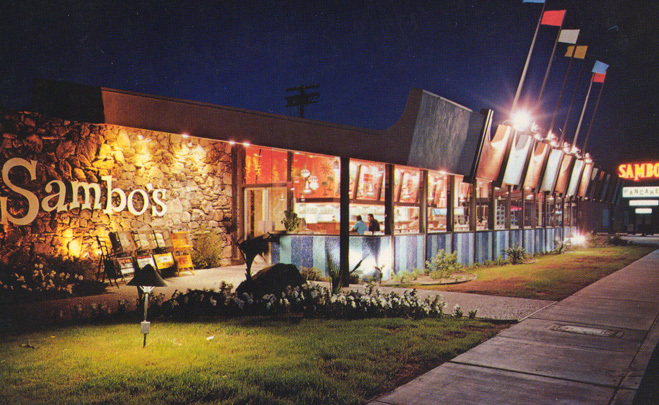 When the owners of an increasingly popular restaurant chain decided to brand the turn-of-the-century Sambo's tale as part of their namesake in the 1960s, an explosive controversy erupted questioning who Sambo really was that ultimately caused the business to fail. In the 1960s and 70s, the restaurant chain Sambos in the United States grew quickly as a popular place to grab a breakfast anytime. By 1981 1,117 restaurants in 47 states which had the Sambos name (originally a combination of the owners' names Sam and Bo) quickly came under fire by accusations of racism. One restaurant shut down after another. The next year all but the original restaurant in Santa Barbara, California shut their doors. As you can see from the Sambos case, much experimentation and research needs to be done before designers come up with final logo. Logos lend themselves to controversy because the characters within them are often distorted and out of perspective, leaving them open to be connected to negative symbols and stereotypes used throughout history. The Roy's sign in Amboy, CA has to be one of the best in the world. 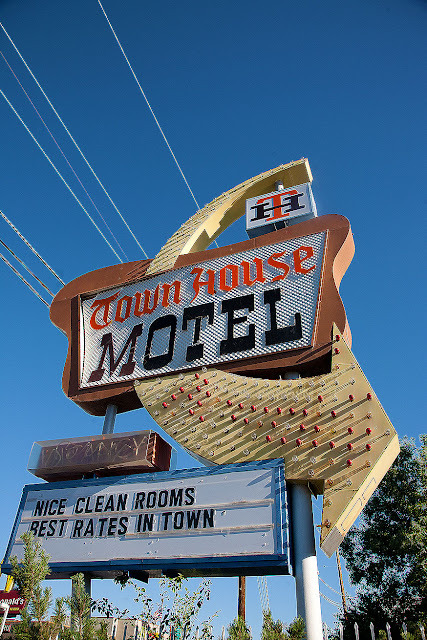 If they were to be an award for the best mid-century modern sign in the world, it would have to be this one. To be sure, it's not the grandest, biggest nor the most elaborate, but it is positioned in one of the best settings for a sign, which is what makes it so special. Nowhere is a sign surrounded by almost nothing but sky and flat land, leaving the sign isolated for beautiful photo ops. 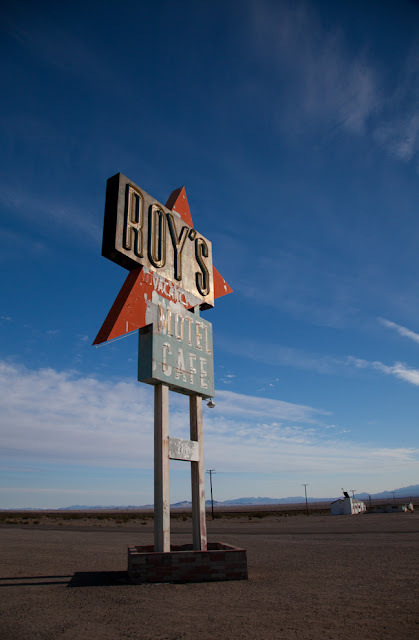 Catch it at the right moment with the right light and just the right amount of cloud cover, and you've got a classic desolate-yet-stunning image of what life was once like decades ago. Pink elephants bring to mind the mid-century era cereal Crispy Critters. 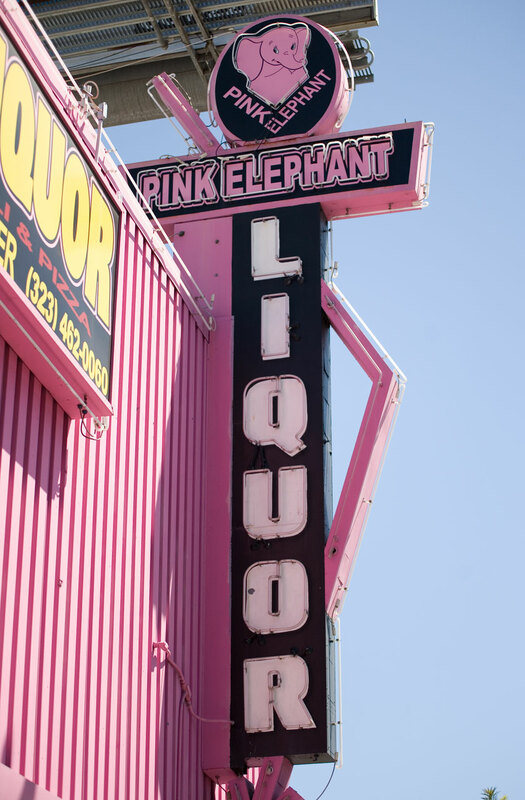 No matter what you do with a pink elephant, put them in a cereal to eat or a sign to get your attention, you'll be noticed with a smile. Flamingo Hotel sign might be the oldest surviving sign on the strip. 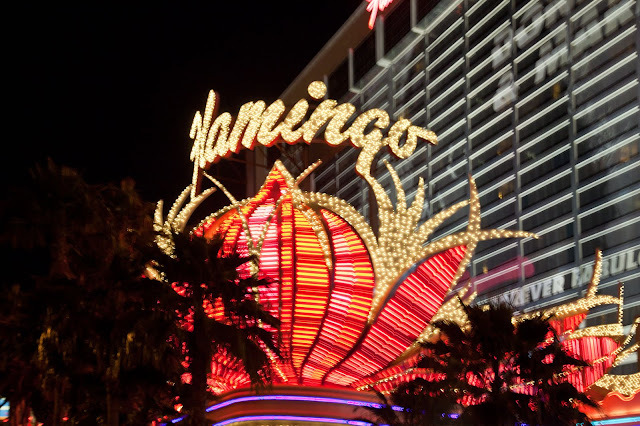 Built in the 1940s, the Flamingo Hotel is allegedly the oldest surviving sign on the Las Vegas Strip. 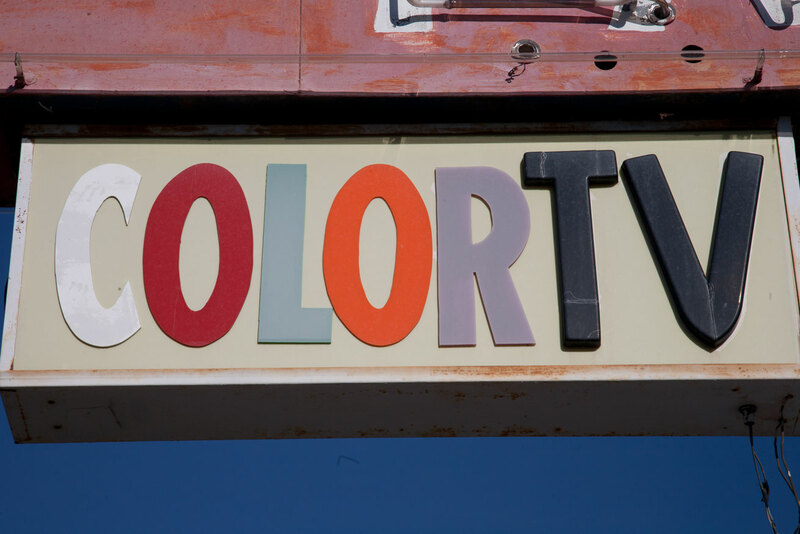 According to the USA Today (Demand Media) the sign was erected in 1967. 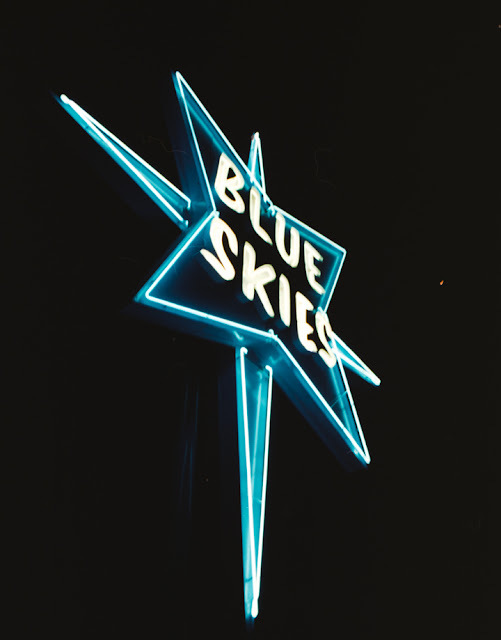 The image above may or may not be that sign, as there are several on the property. I'll be investigating that, but if anyone knows if it's this one, please comment. Mobster Bugsy Siegel ran the hotel, running it into the ground through skimming money from the profits.